The Body Shop Glazed Apple Soap, Limited Edition-This was one of the few Glazed Apple products that was left in The Body Shop, who have up to 40% off their seasonal releases. I actually went in to purchase something for one of my friends, the soap just fell into my basket. I jest, it had been on my wishlist for a while-I was just waiting until it wasn't full price. It smells heavenly, like Granny Smith apples. Kikki K Journal-I actually picked this up as one of my Christmas presents and have already written about it here. 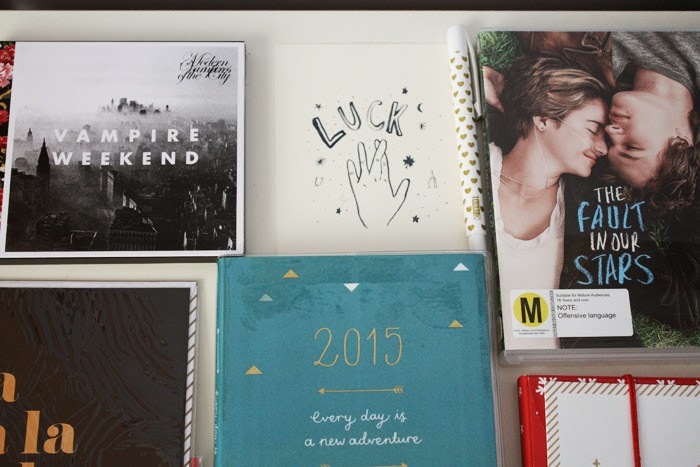 It isn't on sale yet but I think Kikki K usually discount their diaries around January so keep an eye out for it. 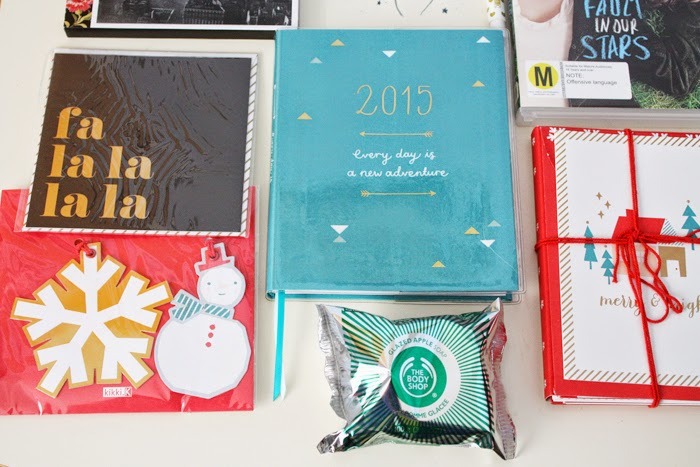 Kikki K Christmas Cards and Gift Tags-Kikki K have an awesome sale going at the moment. Aside from their Christmas stock being discounted, some of their recent ranges are also on sale. Discounts are from 30-50% so you're bound to find a bargain here. I picked up some Christmas cards which I thought were cute and also because I'd run out of cards and need to send one or two more (don't ask). Then I got gift tags because I'd run out of those too and liked these ones-especially those snowflakes. Vampire Weekend 'Modern Vampires of the City'-There's one thing you'll learn about me. I don't like paying full-price for a lot of things, especially CD's and DVD's. Unless I'm too impatient to wait for international shipping, I hold off on buying them until they're on sale. I'd been listening to this album on Spotify a fair bit over the last year and because Vampire Weekend are up there with my favourite bands, it had to come home with me. It is perfection. Vampire Weekend are always on my Summer playlists. Hydrangea Ranger Card-I can't find this online *sad face* but there was a Hydrangea Ranger pop-up shop inside Widdess in Ponsonby and I finally made it there yesterday. As much as I would have liked to take everything home, I escaped with some cards, a mini poster and a few bits for some friends. I'm a bit obsessed with the Hydrangea Ranger brand at the moment and love to support them when I can, especially as they're New Zealand girls like me. The Fault In Our Stars DVD-Aside from Gone Girl, this has to be one of my favourite films I saw this year. It probably helps that it is adapted from one of my favourite books, stars Ansel Elgort, features a love of writing, stars Ansel Elgort. You get the idea..
Kikki K Gold Hearts Pen-Now this wasn't on sale but I used my student discount towards it so it was a tad cheaper. Gotta take advantage of that whilst I still can, right? It's not coming up on their website so I am guessing it may be new but they had a few of these pens with gold patterning. New year, new pens. *Did you pick up anything during the end of year sales for 2014? 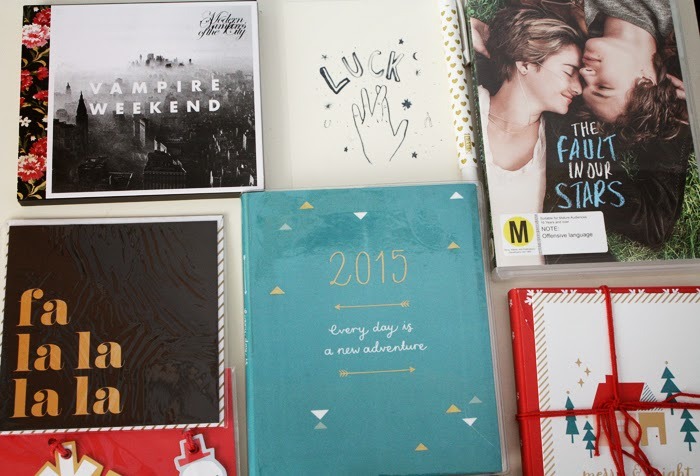 kikki.K will be the death of me, I seriously want everything there! I stocked up on some lovelies from Lush but have otherwise restrained myself ... for now.